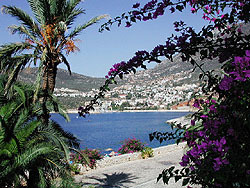 I am assuming that you have found this site with an interest in purchasing property in Kalkan. With that in mind I aim to tell you about Kalkan through my experiences of being a villa owner in Kalkan for sixteen years enjoyable years with anticipation of many more, the loves, which are many and the dislikes which are few plus some of the advantages and disadvantages of being a property owner in Kalkan. As you may have already found out or will read on the various websites Kalkan was once an Ottoman Greek fishing village named Kalamaki, Kalkan, this historic town of Kalkan is without doubt an enchanting place and one of the most beautiful locations along Turkey's gorgeous Lycian Coast, you will here it also described as the Turkish Riviera, a description well deserved with its blue crystal waters, accompanied by historic architecture, ancient history and the addictive traditional Turkish hospitality. Myself I love the current absence of mass tourism, the charming unspoilt and lush nature, old Ottoman houses unforgettable rooftop restaurants, the traditional Mediterranean harbour displaying the various styles of Gullet rather than gin palaces seen in most Marinas. Kalkan is also well situated to explore numerous histories sites such as Xanthos, Letoon, Patara all within a short drive away, there of course is no need to drive, as there are excellent local tours available throughout the village. In the village itself you can find plenty of history, there are 2 mosques, one of them was originally a Greek orthodox church, and you can still see a small cross on the roof. Like any village, town or city you need to walk around to see the sites and mix with the people, this village will leave a lasting impression and you will return to see if it was true. In the old town there are two mosques, one of them was originally a Greek Orthodox Church and you can still see a small cross on the roof. 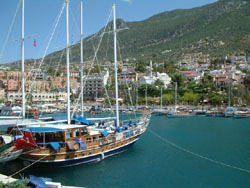 During the Ottoman Empire period over 500 years Turks and Greeks lived there until the early 1920's in kalkan. Today you can see lots of similarities between Turkish and Greek culture, cuisine and lifestyle. During the early 20th century, Kalkan appears to have been quite a prosperous village/port trading silk, cotton which is some of the finest in the world, olive oil Kalkan is surrounded by olive trees, the customs house as ever was I assume busy the building is still overlooking the harbour, however not by the customs anymore, however I am sure they will be watching from somewhere else? As the roads opened up in the early 60s it allowed people to leave and develop business in other towns such as Fethiye and Antalya, some are now returning due to the popularity of the town due to the growth in tourism, a lot of the tourists are turning into residents as I have. I have found far more advantages than disadvantages of owning a property in Kalkan and one of these have been the costs of living compared with other holiday destinations and certainly compared with the UK, outgoings on your property will be minimal in particular if you are retired and want to make your income/pensions give you a good standard in retirement. Kalkan offers quality of life, if you are looking to slow down with the pace of life then there is no better place, however sometimes it is frustrating as most things happen tomorrow. I have learned to realise this, I believe that the attitude of life by the locals is the right one and I am grateful for their teaching. The local services, roads, water, electricity have all been improved with the property development in and around the village, there is of course the odd power cut and water shortage but not as often as it was, modern villas and apartments now have solar heating, water storage stand by generators and romantic candle lit restaurants. Value for money, Well I have lived in Sandbanks in the UK and still have an office in the area, I look after the websites of leading estate agents in Sandbanks so I am confident that property in Kalkan is excellent value for money, however it is advisable to do your homework and if I can be of assistance in any way then contact me and it will be a pleasure to help, if I dont have the answer my colleagues in Kalkan will.